Make your vacation heavenly this year, and escape to A TOUCH OF HEAVEN! Hidden off Ridge Rd just one mile from the main parkway, The Cal Ripken Experience, Dollywood, & The Island - there's no better location for your Pigeon Forge getaway! Enter from level parking across the covered porch and into this charming one bedroom studio cabin. A queen log bed opens to a living area with a queen sleeper sofa for extra guests. Prepare some popcorn, or your favorite snack in the fully appointed kitchen, then snuggle up in front of the stone / gas fireplace and watch your favorite movie on the LED TV. 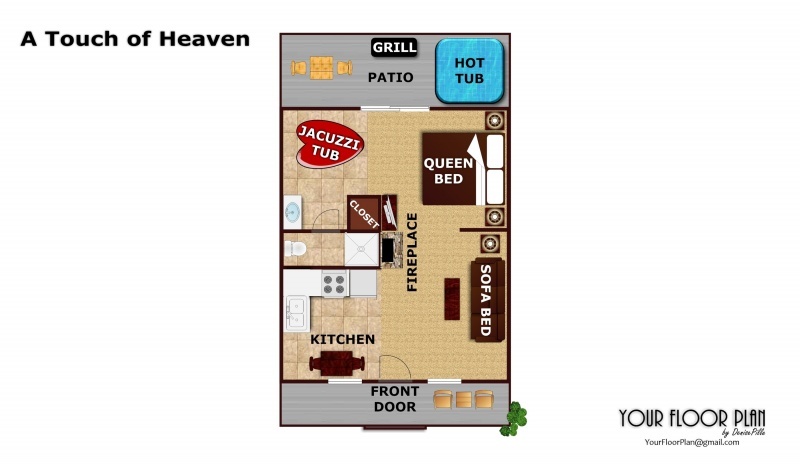 Or soak away your cares while you relax in the heart shaped Jacuzzi tub! Outside a second covered rear porch includes A private hot tub area for two. Put the heavenly touch on your vacation this year, and plan your stay today at A TOUCH OF HEAVEN! Great little cabin, ideal for a couple looking for a quiet weekend getaway. Only 5 minutes to the parkway. Really enjoyed it. Close to everything yet very peaceful. Really enjoyed ourselves. This was our vacation this year & got to take our chihuahua. It was her first vacation. It was awesome. Love it every time we go to pigeon Forge. Loved staying there so much I forgot our check out date.. the only thing I would of like to of seen was maybe a channel listing of the tv channels that are viewable. I have told several family and friends about your cabins. I will be booking a vacation atyour cabins again. Thank you for such an amazing time. There was a problem with the Hot Tub when we checked in that was resolved next day.In all the years that we have used American Patriots, this was the first time we encountered any problem in any cabin we've stayed at. I was very impressed that this issuewas resolved without needing any further contact with the staff ... Good Job !!! !